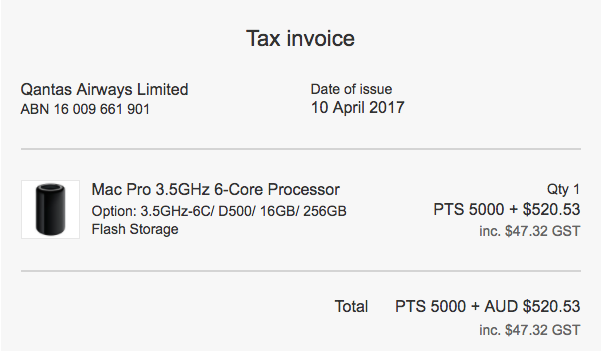 Apple Australia's base price for the Mac Pro is AU$4,899. So when Australian airline QANTAS store for frequent flyers started offering the computer for just AU$$520.53, plus 5,000 frequent flyer points, news of the bargain quickly hit sites that track this sort of thing. A single QANTAS frequent flyer point is worth somewhere between half a cent and six cents, according to Australian Business Traveller. Even at the highest valuation per point, that would have made the Mac Pro just $820-odd dollars and represented a colossal saving. Unsurprisingly, the computer sold out but not before friends of The Reg grabbed one, and the screen shot below of their bargain. Also unsurprisingly, the super-discount turned out to be an error and QANTAS therefore wound back the deal but also offered disappointed buyers 2,000 frequent flyer points and a 20 per cent discount on a Mac Pro if they buy it in April. Pic Passenger reported it lost but when crew tried to find it, the business class seat struck!